outer space x-mas ~ Christmas A Go Go! In the eighties I released a serie of three special cassettes, 'Oscar's X-mas Carols'. I invited befriended musicians like Pascal Comelade, Ptôse, Legendary Pinkdots, Van Kaye & Ignit, Grandmaster O or Doxa Sinstra to contribute a track. It's all experimental and electronic stuff. Some of it we now call Minimal Wave. 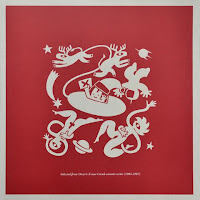 Spanish label Domestica just a released 'X-mas Card From Outer Space', a sort of Best Off Oscar's X-mas Carols, on LP only. The drawing on the sleeve is made by Dutch designer Max Kisman. If you like adventurous and unusual festive music, check out this LP here. The title track comes from the Dutch outfit Ende Shneafliet.